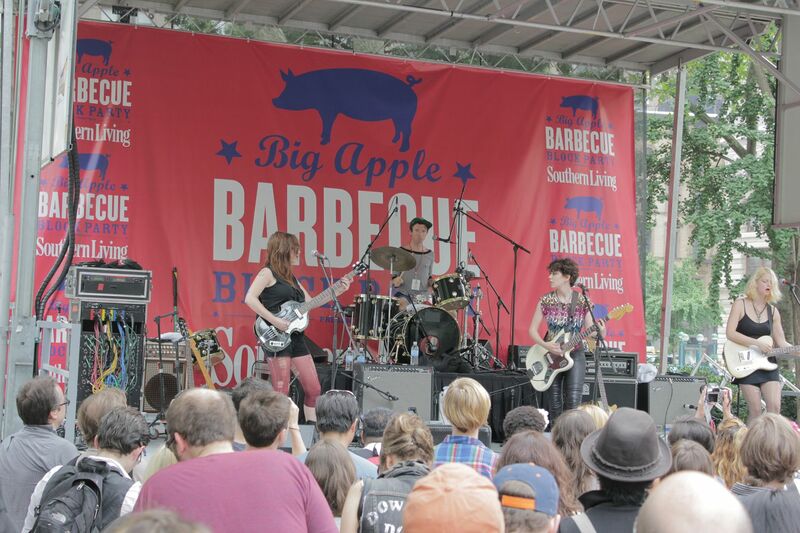 The 9th Annual Big Apple Barbecue Block Party made its triumphant return to Manhattan’s Madison Square Park on Saturday and Sunday this weekend, bringing together the country’s top pitmasters cooking up their award-winning food, for over 100,000 barbecue enthusiasts. Some of the country’s biggest names in ‘Cue were on hand, dishing out heaping portions of their distinct fare for just $8 per plate. As a group of die-hard carnivores, the LocalBozo crew insisted on arriving early. 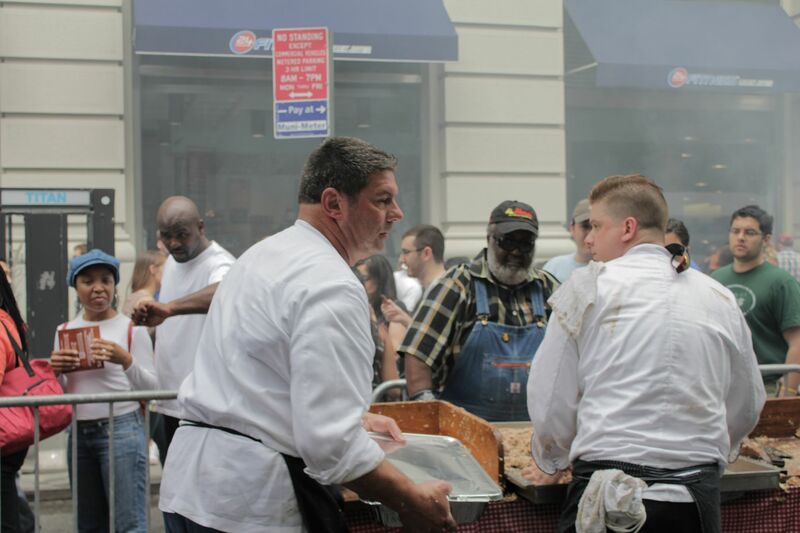 The Big Apple BBQ Block Party is a massive annual event. Since it takes place just once a year and admission is free, the crowds of people are immense and lines can be lengthy. With that being said, patrons have to come with both an appetite and patience, as many of the popular joints will have lines that stretch down the block. The FastPass option- available every year, and allows first class style priority access to some shorter ‘Cue lines- were unfortunately were sold out in advance of the 2011 Block Party. 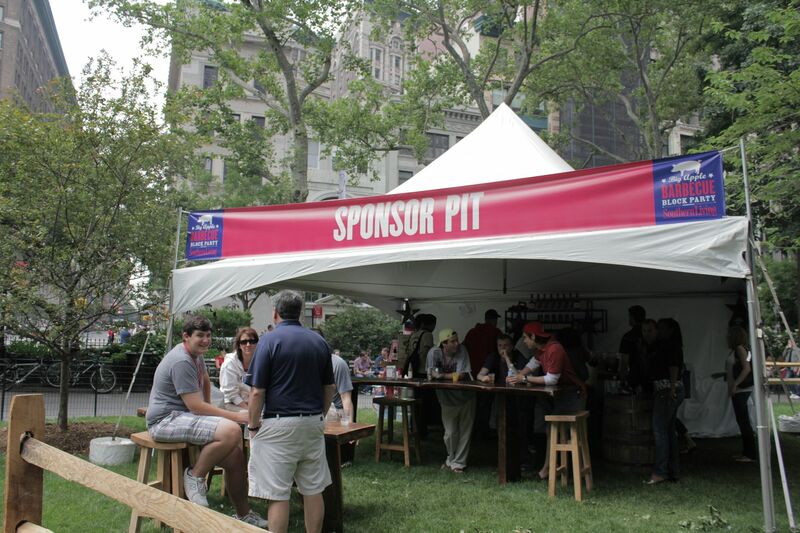 But the event organizers packed the weekend with other ancillary events like live music performances, a bevy of seminars, demonstrations, and book signings, a merchandise tent and a beer garden, all designed to distract you from the tedious insanity of waiting. 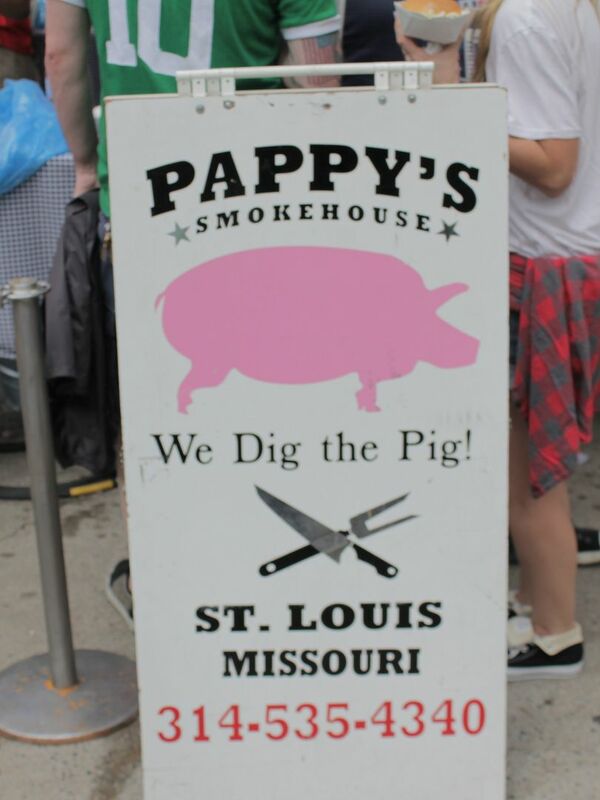 St. Louis, Missouri is arguably one of the most prominent locations for BBQ in America, so naturally any wait here would surely be worth it. 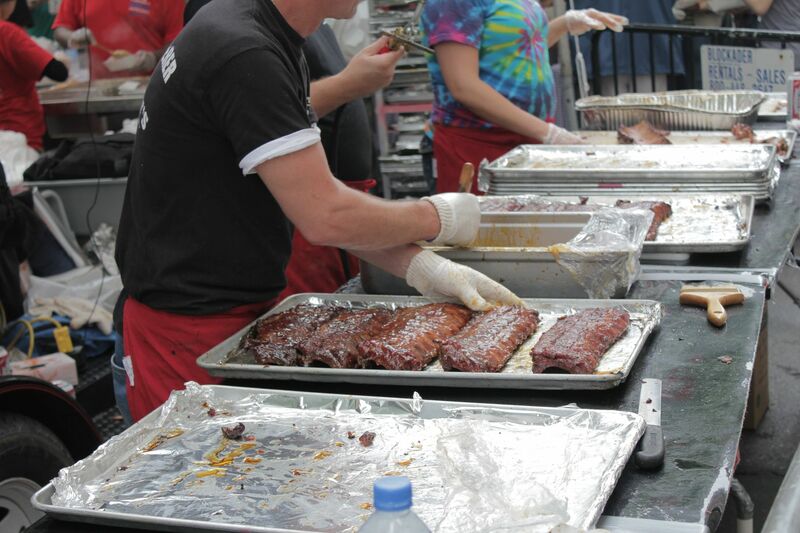 Sauce is king, and is used liberally on items like their famed thick, pork ribs. 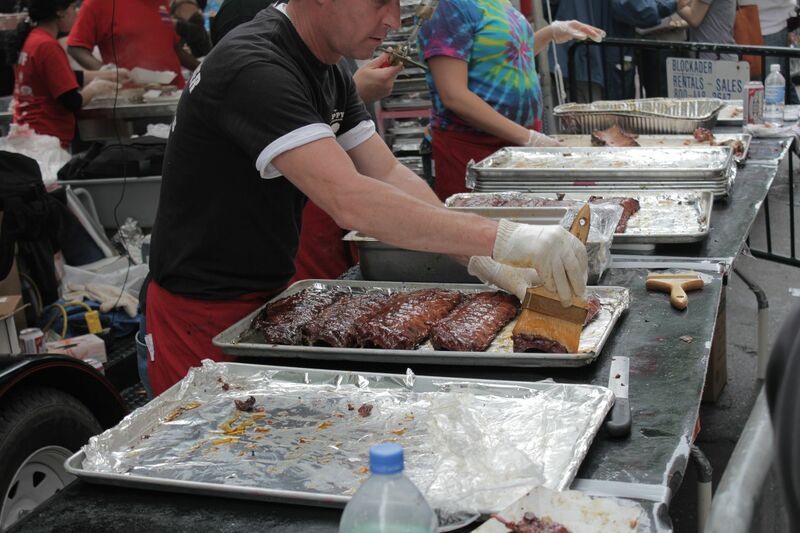 The St. Louis style rib, is re-sauced during cooking which produces a caramelizing effect to the meat. 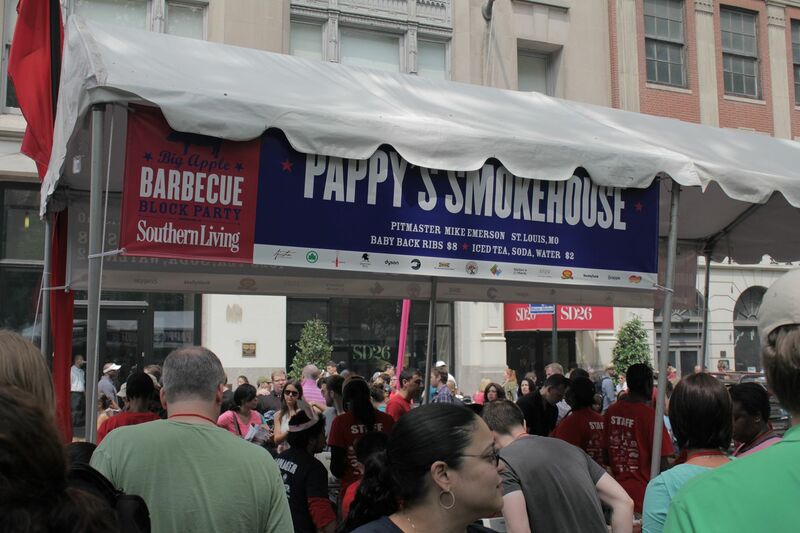 The “Lou,” as it is commonly called, was represented at the Block Party with the attendance of the widely popular Pappy’s Smokehouse. 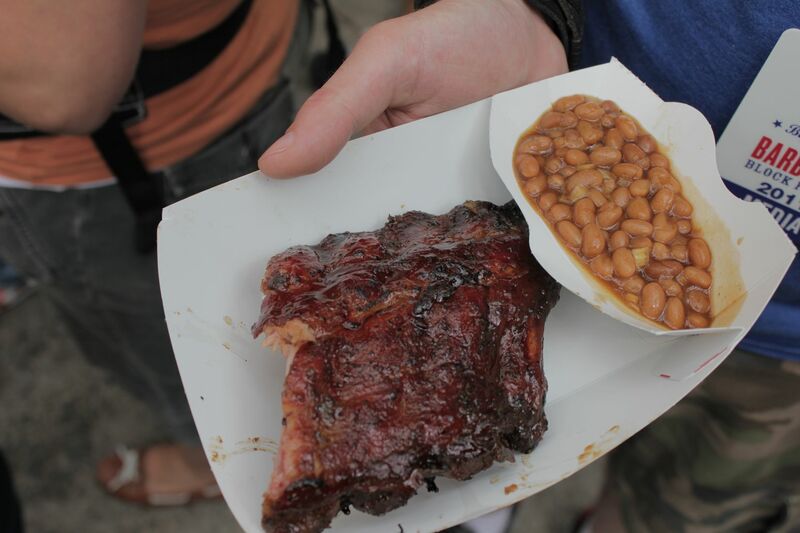 As seen on The Travel Channel’s, “Man vs. Food,” ribs are their house specialty. They are dry-rubbed and slow smoked over apple and cherry wood. 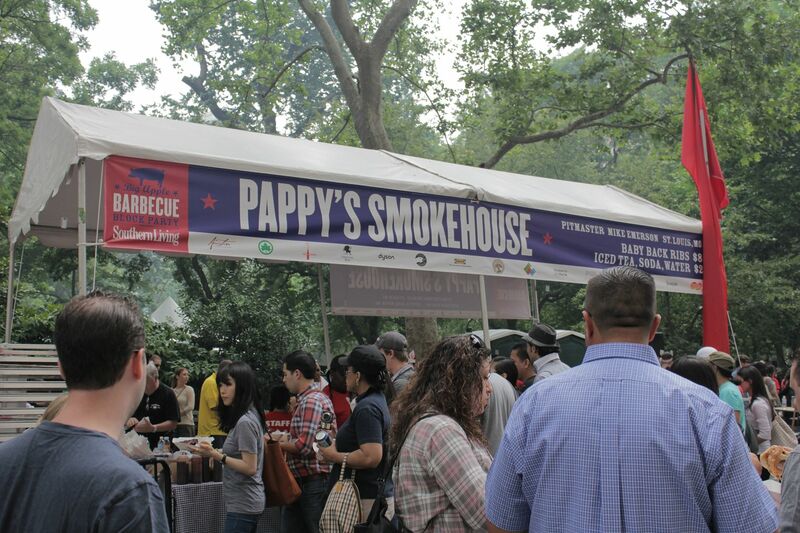 Once we noticed that Pappy’s was in the house, the ribs became a must have for our crew. Served as a half rack with a side of tasty baked beans, the unique meat was tender and fell off the bone like any well made ribs should. 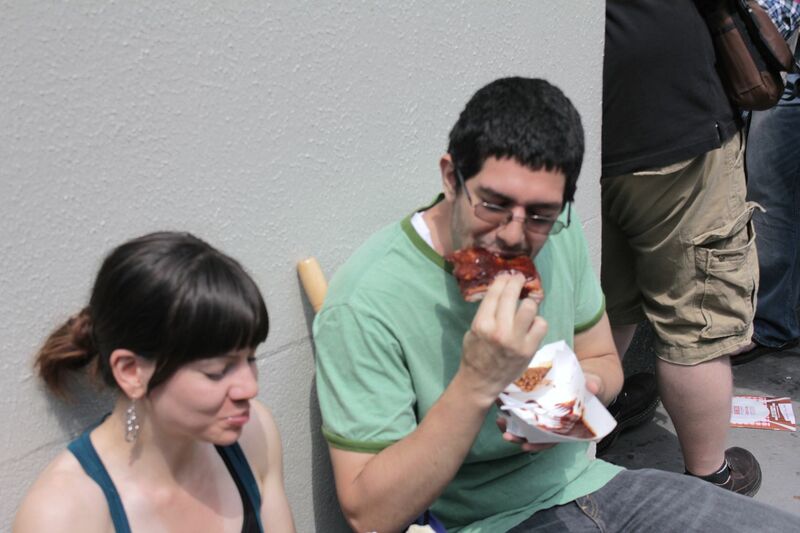 But the sauce had a certain indescribable sweetness to it that we don’t recall having tasted before, and complimented the smokiness of the ribs themselves. Where the ribs proved flavorful, our eyes set out for the barbecue staple- the pulled pork sandwich. Now, pulled pork can be found on plenty of menus throughout New York City, but it takes a true artist to build the perfect pork sandwich. 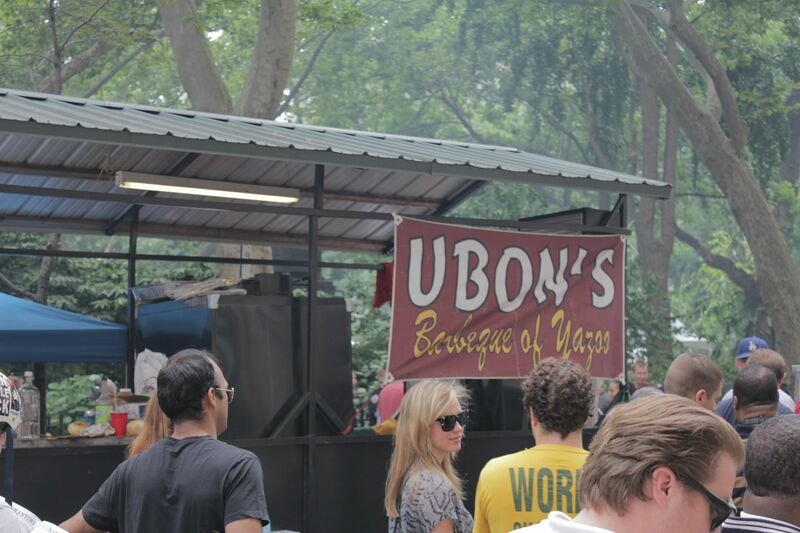 As we walked through the bustling streets of Madison Square Park, we spotted dozens of patrons chowing down on these porky delights. We stopped a group of guys who were all devouring pulled pork sandwiches, so naturally we inquired. With meaty glee and full glistening mouths, they exulted aloud, “Ubon’s!” After a quick scan of the park we found it- Ubon’s Smokehouse of Yazoo, MS.
Each Ubon’s sandwich was served on a hamburger style bun and paired with a side of creamy cole slaw. The pork was tender and moist while the sauce had a Kansas City flare to it, being both incredibly sweet and tangy. The side of cole slaw paired brilliantly with the sandwich (as any pitmaster will tell you) and it was some of the best slaw that we’ve ever had. Once our stomachs were full and walking around the jam-packed park proved repetitive, it was time to call it an afternoon. 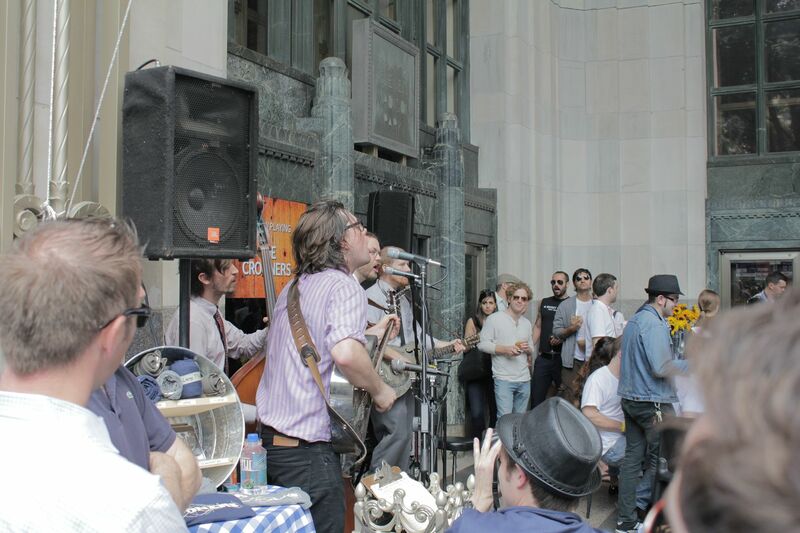 The folks behind this year’s event once again showed that despite thousands of people, New York City can expertly run an efficient and infinitely enjoyable event for its inhabitants. 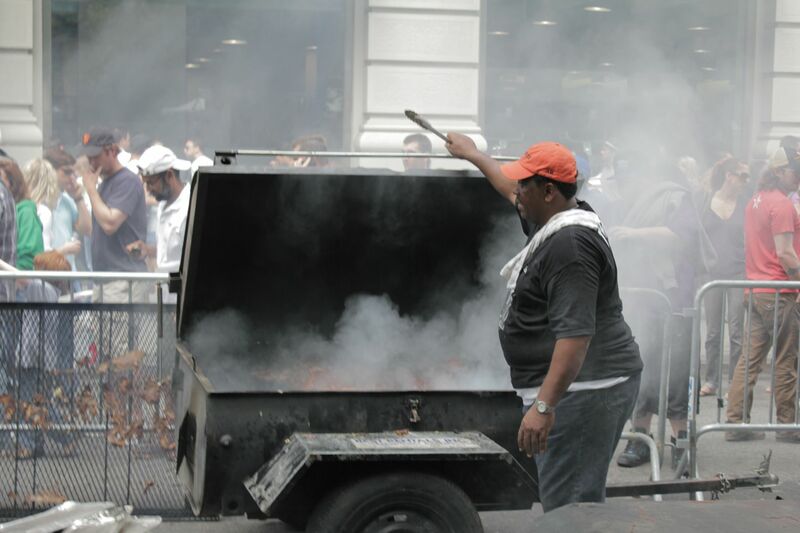 Proceeds from the Big Apple Barbecue Block Party help to support the Madison Square Park Conservancy, the organization responsible for the beauty, ongoing maintenance, and programming of this historic park. And we were happy to lend a helping, albeit sauce covered, hand. 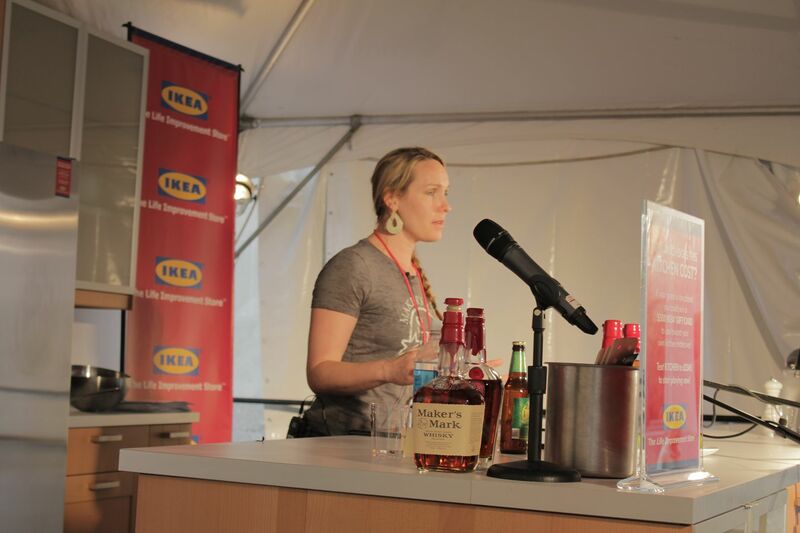 what a great event and what seems to have been a wonderful afternoon of some real good eats. Your dsescriptions and especially the reviews of the vasrious dishes places u devoured seems to have highlighted the entire event. I also ebjoyed the pictures and and the remarks about the food u tasted. The Richmond Hill Country Club has evolved into a first class four season retreat thoroughly enjoyed by all of its members. It is a sports Club… a spa and fitness club… a social club a first class catering facility with a full range of programs for your family or corporate lifestyle all this and much more. Over 240,000 square feet of indoor facilities, surrounded by outdoor recreational facilities, terraces and inviting nature walks. All in a central easy-to-reach location, as accessible as your own back yard. We invite you to visit us and experience the excellent service and activities by contacting our Lifestyle planning department for a complementary “Day On Us” guest pass. We will be happy to introduce to you all the Club’s year-round programs of fun activities and events, all designed to enhance your personal lifestyle.